Every thinking person is continually brought face to face with the need to discriminate between what is true and what is false, what is probable and what is doubtful or impossible. These decisions rest on a combination of knowledge, skepticism, faith, common sense, and intelligent guessing. In one way or another, we decide whether the road to town is too icy for going by car, whether the child is telling the truth about seeing a burglar upstairs, whether the threatened layoff at the local plant will take place after all. All adults have acquired techniques for verifying a rumor and a report so that they can take appropriate action. They supplement their experience and learning by recourse to special sources or items of information --- the broadcast weather report on the state of the road; the child's known habit of fantasy; or the word of the plant manager who has access to firsthand knowledge. Few of those who run their lives in this way stop to think that in the first case they trusted a technical report which, though not infallible, is the only authority on the subject; that in the second case, the ground for judgment was prior observation and inference; and that the third resort was to a competent witness. It is sometimes possible to use all three kinds of aids to judgment, and others besides, such as the opinions of neighbors and friends, to say nothing of trial and error. All but the most thoughtless and impulsive will use their minds before giving credence to others' say-so, and try to collect evidence before trusting their own surmises. The world is too full of doubt and falsehood to make any other course mentally or physically safe. The intelligent newspaper reader, for example, daily encounters "incredible" stories and tries automatically to "verify" them, first by "reading between the lines" and drawing what seems at the moment an acceptable conclusion, and later by looking for further reports. Limited as this effort is, one cannot always make it from an armchair. . . .
(4) they ignore the enigma altogether. A judicious reader will adopt (3), though there is nothing downright foolish about the other choices. But the researcher and historical reporter has a greater responsibility, which denies him the right to any of the four solutions. He may indeed come to rest on (3), but not until he had done a great deal of work; and except under certain conditions, (1), (2), and (4) go against his professional training and obligations. As the student of past events tries to answer the question What did happen? he confronts the same uncertainties as the newspaper reader, but with this important difference: the researcher must try to reach a decision and make it rationally convincing, not only to himself, but to others. The steps by which he performs this task constitute Verification. Verification is required of the researcher on a multitude of points --- from getting the author's first name correct to proving that a document is both genuine and authentic. Verification is accordingly conducted on many planes, and its technique is not fixed. It relies on attention to detail, on common-sense reasoning, on a developed "feel" for history and chronology, on familiarity with human behavior, and ever enlarging stores of information. . . . Source: The above text has been excerpted from Chapter 5, "Verification", pp. 109-112 of The Modern Researcher, 4th edition, 1985, by Jacques Barzun and Henry F. Graff. This "method" (as described above by Barzun and Graff) by which our minds seek "truth" can be described as a 4-step process of discovery. This 4-step process or method is used by people in their daily lives and specialized variations of this process are used by the police, courts of law, historians, scientists and other researchers. Let's give an example from everyday life to illustrate the first two steps of this process. All these alternative explanations [at Step 2] are possible. But you may never know the real explanation [Step 4] for his behavior unless you are willing to get out of your car and find out more [Step 3] about what is actually going on. In other words, you need to collect more information, evidence or data [Step 3], if you really want to answer the question: "Why is the man stumbling down the sidewalk." This prosaic incident shows that there are many possible alternative explanations to explain such an event, experience or phenomenon but in order to rule out the competing possibilities and to come up with the true explanation, i.e. the most probable one, you will need more input, more information, more evidence. You find out that one of your mother's neighbors Mr. Allan was found dead in his home early this morning. Without knowing anything about the man or the specifics of the man's death, you can still speculate about possible causes of his death. (a) Maybe he simply died of old age. (b) Maybe he died as the result of a disease. (c) Perhaps he committed suicide. (d) Possibly he died as the result of an accident. (e) Maybe he was murdered. (f) Or ??????? What is the evidence that will help to determine the cause of his death? The bullet extracted from the wound matched the gun that was found by his body. The gun had his fingerprints on it. A typed letter (unsigned) was found in the dead man's office. The note explained that he was going to kill himself. A few days before he died, he had talked to his mother about how unhappy he was. He had recently told a close friend that his estranged wife was going to divorce him and take all of his money. He and his estranged wife had had a terrible fight the evening before he died. What really happened? Based on the evidence listed in Step 3, how many of the possible explanations in Step 2 can be reasonably excluded? Based on the evidence given, can you determine what probably happened? What explanation listed at Step 2 is the best explanation in light of the known evidence? Or is more evidence needed in order to determine what really happened? A more detailed outline of the 4-Step Process of Discovery is given below. Each step in the process can be described as a statement. 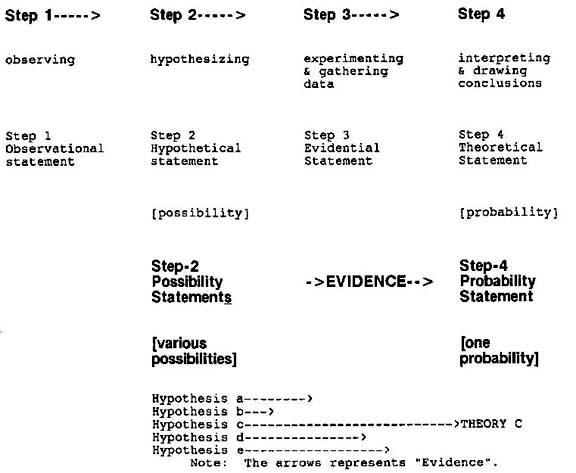 Step 2 and step 4 statements are defined below in terms of "possibility" and "probability." The 4-Step Process of Discovery can also be viewed as a pole vault contest. Each hypothesis is like a contestant in a pole vault contest. The pole-vaulter who succeeds in jumping over the cross bar represents the hypothesis that successfully explains the totality of evidence and becomes the most probable explanation. In the following diagram, what does the height of the cross bar represent? the rule of Give evidence is not to be violated without impunity. No matter how possible or plausible the authors conjecture [at step 2 in the 4 step process], it cannot be accepted as historical truth [at step 4] if he has only his hunch [which is not evidence] to support it. What would be more than adequate for village gossip does not begin to be enough for history. . . . But proof demands decisive evidence; this means evidence that confirms one view and excludes its rivals. . . . [The authors] facts will fit his view and his critics and several other possible views as well. To say this is to say that they support none of them in such a way as to discriminate between truth and conjecture. In short, mere consistency is not enough, nor mere plausibility, for both can apply to a wide variety of hypotheses. in history, as in life critically considered, truth rests not on possibility nor on plausibility but on probability. Probability is used here in a strict sense. It means the balance of chances that, given such and such evidence [at step 3], the event it records happened in a certain way; or, in other cases, that a supposed event did not in fact take place. . . ."
Source: The Modern Researcher, Fourth edition, 1985, pp. 174-175. Red bold and some italics added to the above text. See also Possibility versus Probability.